“Hey, don’t you wanna talk winter pants on your blog? I just ALWAYS wear skinny jeans, and am bored with it”, asked my friend Marion the other day. Well, that’s a vast topic… Like ALL pants? Then I gave it a second thought. 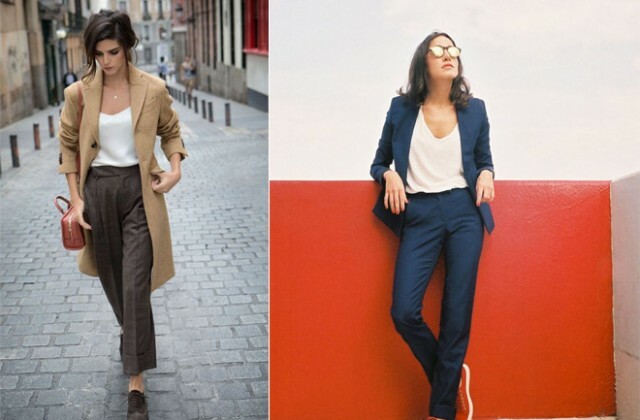 When wearing pants nowadays, lots of us just go for jeans because we do not even think of alternatives anymore. So I prepared you a little catalogue of other pants for winter. And the looks were not that easy to find cause it seemed that more than half of streetstyle looks include jeans (which actually proves my friend’s point). I am already almost cheating, showing a pic of the jolie Valentine wearing what could be a colored denim. Just for you not to forget that skinnies comes in lot of colors and shapes that brighten the dark of the winter. Often has a pleat in the front. As I always say, revealing the ankle is super feminine. “But I am gonna be cold!” Then add socks. They can either be sparkly of printed, but most important, they shall be thin! The risk of those pants is too look a bit mumsy, so pay attention that they are straight and not bootcut: it is way more modern. Carrot pants are larger around the hips than on the ankle. You’ll recognize them easily cause they got two pleats on both side of the waist. They flatter both women with small and larger hips. Since they add volume to the figure, they look their best worn 7/8 or/and with heels. You can wear them either with skin-tights or tucked in tops. Flare or oversize, they suit tall girls better especially in winter times when we all disappear under thick layers of clothes. And even if you are tall and wanna pull out the large pants in winter, I advise you to pair them with heels. 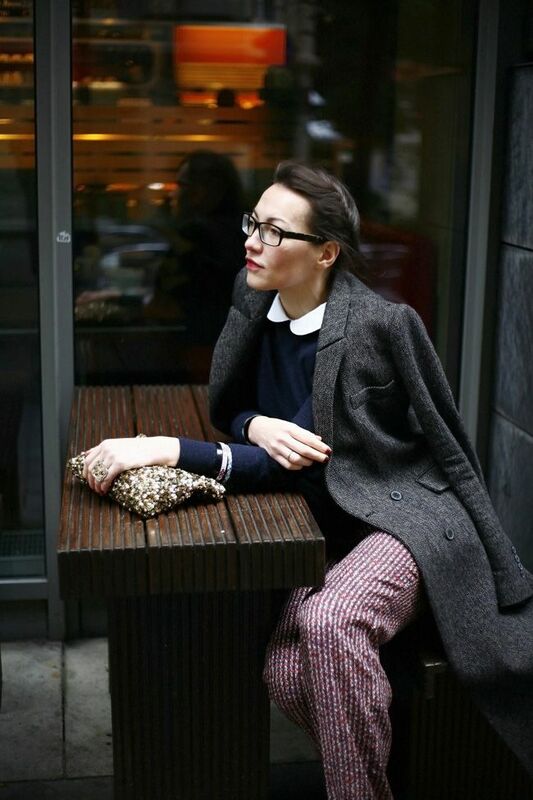 Golestaneh streetstyle: here the flare is worn seventies style: tight on top and oversize on the bottom. 5. High or low waist? High waist lengthen the legs and looks sophisticated whereas low waist (often) makes a cuter bum and looks more casual. There are lots of winter fabrics that we forget about. Corduroy velvet looks english university teacher a bit. Which I think is a very stylish twist. Skin tight leather shapes up the leg. When worn larger, its stiffness really enlarges the silhouette. Therefore prettier on petites. There are thin and thick wool fabric. Thin wool makes good quality pants. Thick wool adds an interesting twist to an outfit. Regarding thick wool, I give the same advice as for the leather. There is a lot of shine in the collections this season. And that’s a good thing cause those fabric can add both shine and sophistication to your outfits. Waxed fabric often looks leather like. Sometime they glow only slightly and sometimes they can be covered in metal. The waxed fabric can often be denim but I thought that because the result is so different it was fair to add them in this article. You’ll find this kind of fabric almost only on skinny cuts. If really coated they shape up the leg. Think of wearing not only different cuts and fabrics but also different colors and prints and have fun with pants this winter! What about wearing tights under 7/8 pants, does that look okay? Tights are never very good under pants. Unless you mean tights socks.